In Boorowa 43% of people identified as Catholics. This was 89.4% higher than the NSW average. 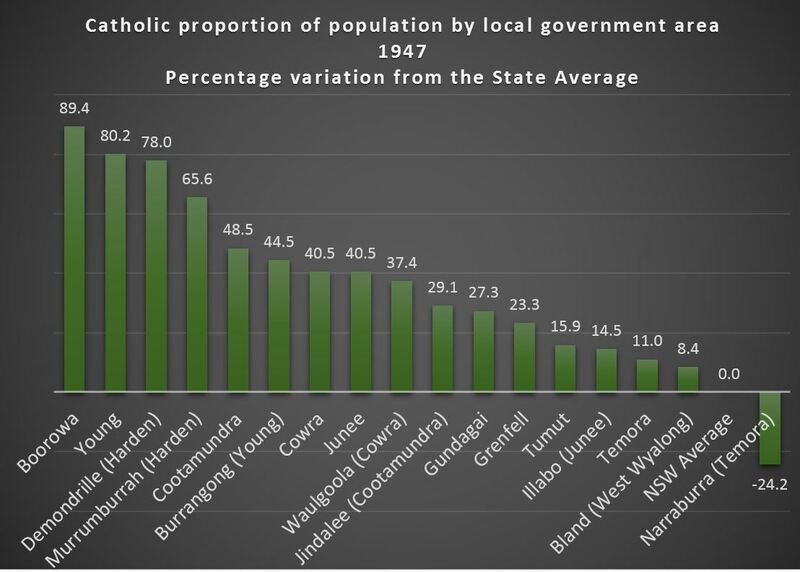 All muncipalities and surrounding shires in Maher Cup country had a higher proportion of Catholics than the state as a whole – except for Narraburra with its German heritage. The most intensely Irish-Catholic areas were in and around the towns of Young, Boorowa and Harden-Murrumburrah, decreasing as one moves west to the wheat areas of Temora and West Wyalong and south towards Gundagai and Tumut. Despite their very large numbers, the Irish did not concentrate their settlement in such a way as to create predominately Irish areas. The largest and oldest Irish area was in southern New South Wales, with its centre in Cootamundra. By 1891 the adjoining counties of *King, Harden, Forbes, Murray, Wallace, Buccleuch and Beresford formed the largest Irish area in Australia, measured by Catholicism and birthplace. However only in Boorowa were more than 50 percent Catholics…… This part of New South Wales is almost unique in its consistent support for the ALP, being the only major rural area to retain that loyalty to the present day. * These cadastral counties constitute an area that can roughly be drawn from Goulburn south to Cooma, west to Gundagai, north to Forbes, and east to Rugby. Murray Phillips (Football, Class and War: The Rugby Codes in New South Wales, 1907-1918) and others have characterised Rugby League as a working-class sport where Catholics were over-represented, with Union being middle-class and Protestant. However in Maher Cup country Union was simply replaced by Rugby League by 1921. It disappeared until clubs were reformed in the 1950s and 1960s – leaving League to be loved by all classes, and all religions. 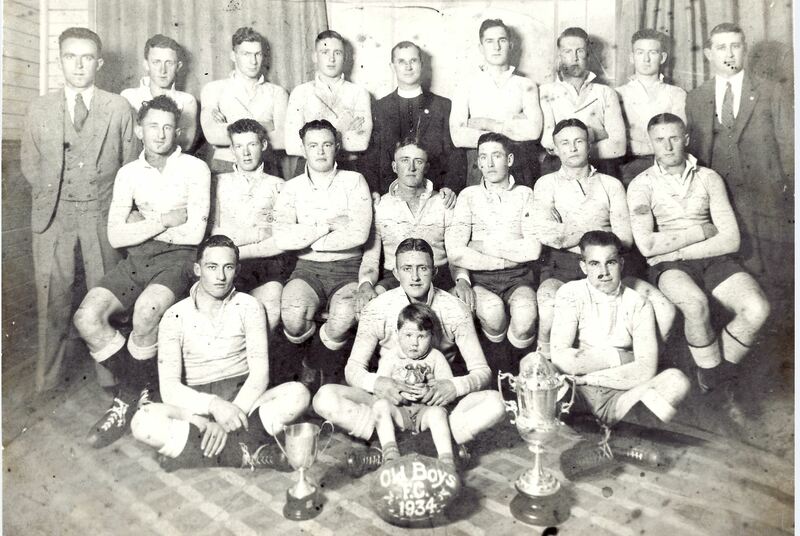 De La Salle Old Boys 1934 – most of who later played Maher Cup football. However for us raised in Maher Cup country the Catholic dominance was quite obvious. For example, the successful Cootamundra Maher Cup teams of the late 193os were overwhelmingly composed of local De La Salle old boys. As a teenager at Grenfell in the 1960s our team was competitive against surrounding state schools and town teams. However the reality check came when we entered a knockout at the Marist Brothers’ Red Bend school outside Forbes. The school was a shrine to Rugby League with multiple manicured fields of a standard that we could have only dreamed of. At half-time our coach implored us to try to keep their scoring rate to below a point a minute. It was doubtful that the Red Bend boys were more working class than us, but when Catholics went to posh schools they still tended to play League. There were the Catholics and the Protestants. The Catholics all lived up on the hill near the Catholic Church and the Catholic school. I played football and the Catholics were the best football team. We always believed that the Brothers knew all the tactics and taught the kids how to play tough football and that is why they always beat us’. Perhaps the difference was that the Catholic community had priests. Often Irish born and without local family, they seemed to fill much of their time coaching sporting teams and generally fostering Rugby League. At Junee, in 1919 popular local priest Monsignor Buckley donated a handsome trophy to kick-start the move from Union to League. 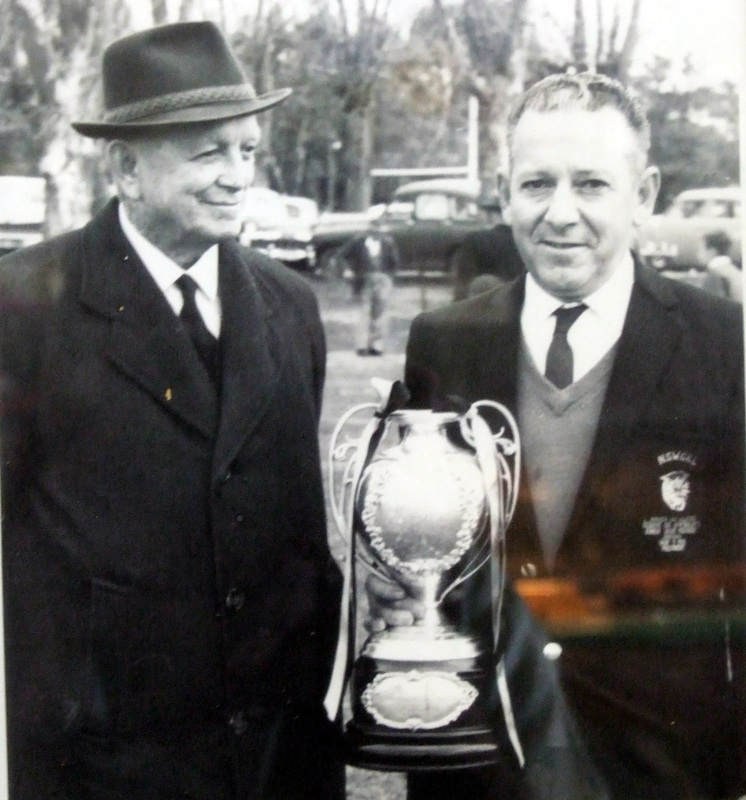 One of the most remembered characters in Maher Cup football was Father John Morrison of Boorowa. He played for Young in the 1930s and refereed for some thirty years thereafter. An old footballer related this story: ‘We had a game at Boorowa and the coach went up to Father Morrison who was refereeing. ‘Father’, said the coach ‘I trust that you will treat us fairly today, I have 12 of your flock in the team’. Father Morrison replied ‘Yes, but you must remember there are 14 of us in the Boorowa side’. Names of Irish origin dominate the roll of significant men in Maher Cup history – players, coaches, administrators and publicists: Bill Brogan, Ron Crowe, John Kelly, Artie Kelly, Bill Kearney, Bill Kinnane, Cal and Snowy Lynch, Roley & Neil McDonell, Reg Maker, Bernie Nevin, Peter O’Connor, Phil Regan, 2LF’s John O’Reilly, the Sullivans of the Gundagai Independent, historians Maurice Sheehan, Paul McCarthy, John Madigan and Wal Galvin. While West Wyalong, Barmedman, Temora and Grenfell people supported Country Party candidates during most of the 52 years of Maher Cup history, towns to the east and south were much more likely to have Labour members. The two most significant were Young’s Fred Cahill (MLA 1941-1959) and Billy Sheahan (MLA 1941-1973) from Jugiong. Part of the reason for the strong ALP presence was, as Jupp above states, the historic nexus between Irish-Catholics and the labour movement – but it was more complex. The wheat country was dominated by ‘cocky’ farmers, characterised as thrifty, even stingy, often poor, but also with a fearsome independence and dislike of unionism. Unlike the graziers along the Murrumbidgee and at stations such as Kimo and Wallendoon, they did not support a large population of likely Labour-voting rural labourers. In Junee and Harden the railway was the primary employer and the unions effectively got out the vote. After the Maher Cup era, although Terry Sheahan retained his father’s seat until 1988, the Whitlam years witnessed the end of the coalition between Catholics and Labour. These days few polling stations regularly return Labour majorities, although working-class South Gundagai and indigenous Brungle sometimes do. Fred Cahill, the son of a timber-getter rose to power on the shoulders of Rugby League. He was a journalist for the Young Witness and became a football club and Group 9 official. Cahill was an articulate advocate for the rights of country administrators to make decisions about how the local game was to be run. The NSW Rugby League was the fiefdom of the Sydney clubs. Their decisions regarding country football were often ill-informed and stupid. In 1931-32 there was widespread discontent over the League’s decision regarding a Temora vs Tumut protest. But it was the long-running protest between West Wyalong and Temora in 1933 that was the impetus for the creation of the Country Rugby League the following year. The move for change was strongest in Group 9, with Fred Cahill recognised as the CRL’s founding father. A Gundagai footballer declared Billy Sheahan to be the best member of the Gundagai football team. His family had for generations owned a hotel in Jugiong. He was perhaps the consummate local politician, forging close ties with many local organisations – but particularly with Rugby League and Catholic ones. He was for example able to expediate the demobbing of a key Gundagai player at the start of the 1946 season and assist the transfer a teacher and top footballer to a Gundagai area school. Billy Sheahan, Gundagai hotelier Paul Foley and grazier Stanley Byrne Crowe from the Rugby League Club along with the Sullivan Brothers of the Gundagai Independent formed an influential partnership of Hibernians in matters football. The Independent was the most influential paper in Rugby League over the Maher Cup area, being read way beyond the Murrumbidgee banks. In the early 1950s Gundagai, population about 2,000, built probably the best Rugby League team ever seen in country New South Wales. Sectarianism existed during the Maher Cup years. I’ve been told that the intense rivalry between Young and Temora had Catholic vs Protestant overtones. However given that the Lynch family produced some of Temora’s best players it is likely to have been overstated. Religious discord was particularly apparent among school-children who formed tribes to engage in confrontation on the way home from school. The influence of the Masonic Lodges (particularly in matters of employment) were often resented. But these divisions declined over time – and possibly football assisted this decline. 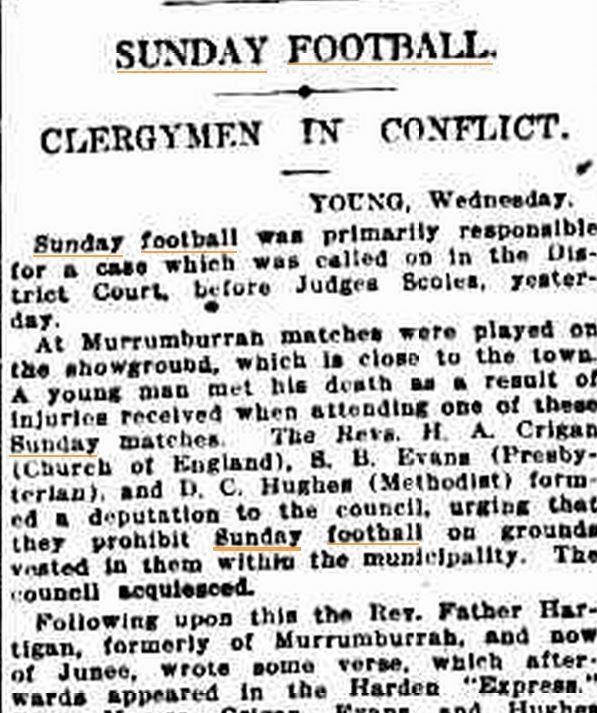 In the early days of League there was a reaction to Sunday football led by the Protestant clergy in towns such as Temora, Cootamundra, Young, Gundagai and Harden. The Catholic priests seemed much more relaxed. At Murrumburrah in 1917 the three Protestant minsters took Father Hartigan (brother of ‘John O’Brien’ of Around the Boree Log fame) to Court over a poem he had published supporting Sunday Rugby and damning the hypocracy of the plaintiffs. In the world of Maher Cup football I suspect that sectarianism was muted, largely because the Catholics were the movers and shakers – they were the dominant force. It was their world. We Protestants could only respect their dedication, talent and passion for the game we shared. This entry was posted in Demography, Communications & Media and tagged Catholics, Labour Party, Religion, Sunday Football. Bookmark the permalink. i always thought Fred Quinlivan came to Young at the Maher Cup coach, he was from Taree. 3 or 4 brothers played for South Sydney…. Do you know anything about this, I’d love to know. Hi Roseanne. Nice to make contact again. Yes he did come from Taree as the coach and he came from a big family with some brothers playing with Souths. I was communicating with Todd a little on Facebook about the Quinlivans a while back. I’ll get together all I can find and send it to you. Maybe we should catch up next time I get up to Young. All’s well here, hope the same with you.